Wow! The look and weight of smooth polished granite but made of durable polyresin. Absolutely looks like stone. Just beautiful. Smooth surface with unique styling. Designed and produced by well-known German brand Kleine Wolke, established in 1968, and is backed by their quality guarantee..
Tumbler: Thick stone like construction with a smooth finish. It looks just like granite. The opening and shape of the tumbler is almost triangular. Really unique and ergonomically designed. Soap Dispenser: Looks like granite but is durable polyresin with a brushed chrome pump. This dispenser holds 10 ounces of liquid soap. Soap Dish: Smooth granite look in some what of a triangular design. 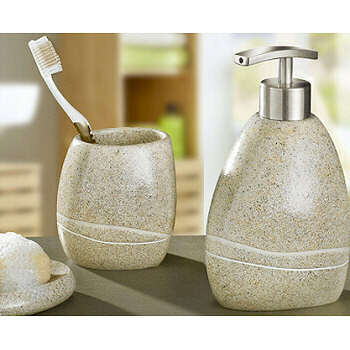 Toilet Brush Set: Really beautiful stone look with soft smooth finish. Sand Beige: You can see the speckles in this granite stone like finish. It is truly a sand beige granite color. Dark Grey: Truly like a dark grey granite stone.